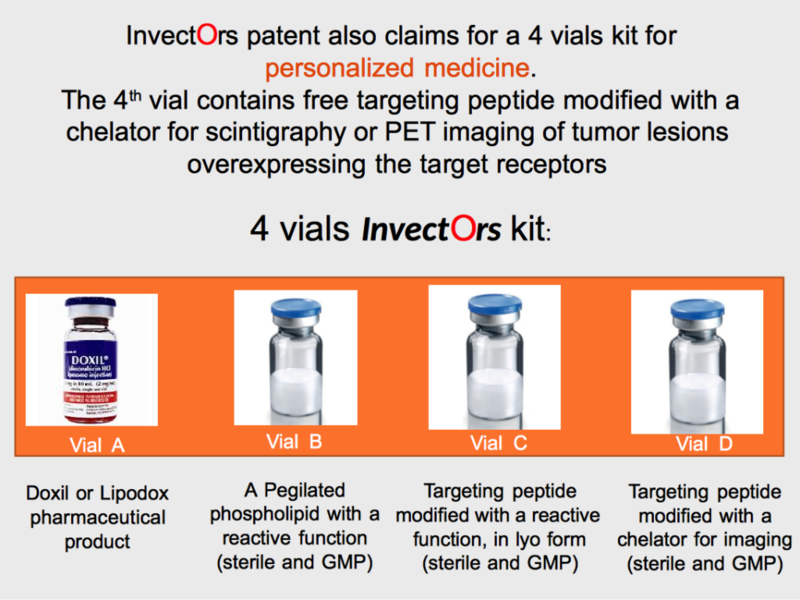 Invectors most appealing products are new delivery systems for diagnosis and therapy, based on supramolecular aggregates (micelles and liposomes) derivatized with bioactive peptides. NAPOSOMES™ ARE NEW SUPRAMOLECULAR AGGREGATES (LIPOSOMES) CONTAINING CHELATING AGENTS AND BIOACTIVE PEPTIDES ACTING AS EFFECTIVE AND SELECTIVE DELIVERY TOOLS FOR DRUGS AND/OR CONTRAST AGENTS. Naposome are supramolecular aggregates obtained by co-aggregation of phospholipids with a) two monomers, a first monomer containing a chelating agent able to coordinate a radioactive or paramagnetic metal ion and having a lipophilic moiety and a second monomer containing a bioactive peptide linked to a similar lipophilic moiety; or with b) a single monomer containing both the chelating agent and the bioactive peptide. 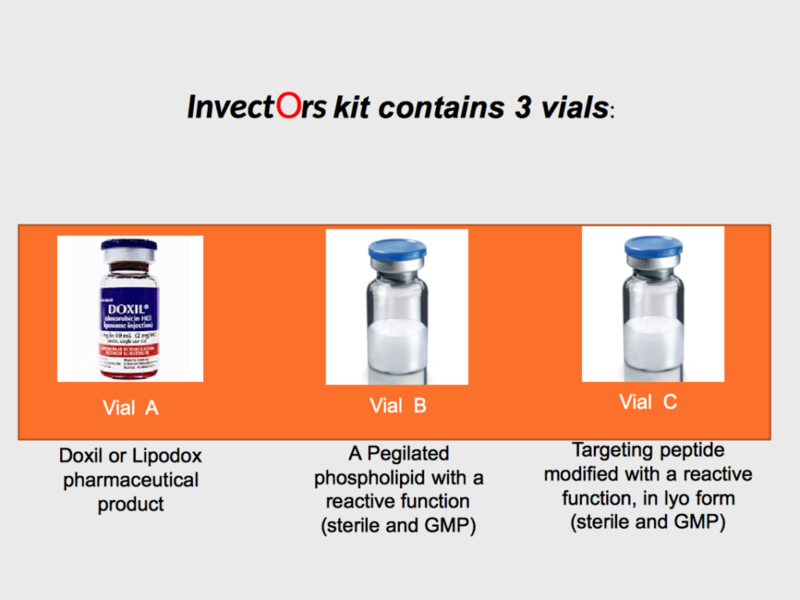 The aggregates are selectively driven by the exposed bioactive peptide on the chosen biological target. The aggregates (micelles or liposomes) entrap on their inner compartment or in the phospholipid bilayer, a pharmaceutical active principle (drug). The main aspect is based on the finding that selective and specific contrast agents or drug delivery systems or a system containing simultaneously a drug and a contrast agent, could be obtained by assembling together in a supramolecular adduct two different monomer components, one containing a bioactive peptide able to give high selectivity and specificity to the entire adduct and the other containing a stable complex of metal ions such Gadolinium(III) or Indium(III) able to act as very effective contrast agents in MRI or NM. Both monomers contain a lipophilic moiety constituted by two hydrophobic tails that allow the formation of the supramolecular adducts. 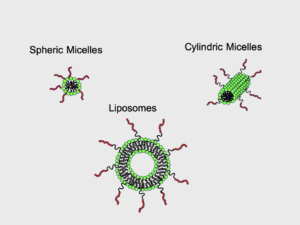 The supramolecular aggregates (micelles or liposomes) formulated starting from the monomers are able to encapsulate pharmaceutical active principles in their inner compartment or in their phospholipid bilayer region. 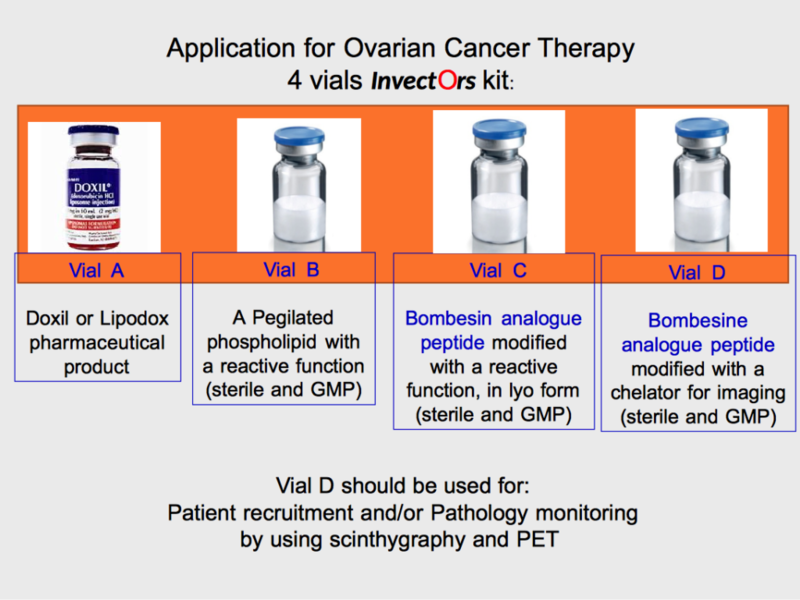 Exceptionally effective and selective drug delivery systems containing a marker able to monitor the circulation and the biodistibution of the drug containing aggregate in vivo by using the Nuclear Medicine techniques if the metal is represented by a a-emitting (111In(III), 99mTc(V), 67Ga(III)) isotope. Exceptionally effective and selective drug delivery systems and powerful radiotherapeutic compounds containing, simultaneously, a drug entrapped in the inner compartment of the aggregate, or on its phospholipidic bilayer region, and a beta-emitting radioactive metal ion (90Y(III) or 177Lu(III)) complexed by the chelating agent. 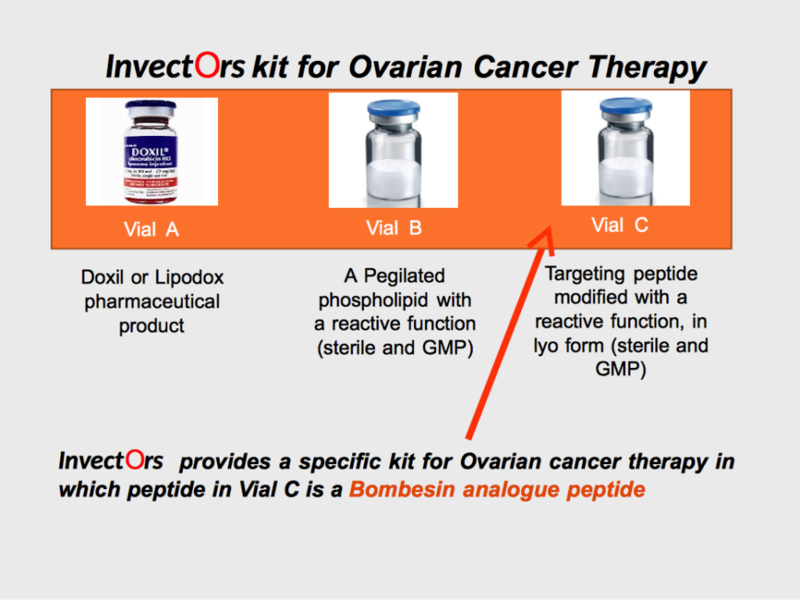 6-14 Bombesin: to target GRP receptors expressed in ovarian and prostate cancers.